Murphy Brown “Three Shirts to the Wind” continues the show’s direct attack on what’s happening in Washington. I’m loving how the show isn’t shying away from the issues and is tackling them head on. Is the acting stellar? No. Is it subtle? Not terribly. Does that matter? Not at all. The episode was written by Laura Krafft and directed by Don Scardino. Krafft has a serious news-parody pedigree as a former writer on The Colbert Show – she knows her current events, and it really shows in this episode. The three shirts referenced in the title belong to Ed Shannon – very ably played by the wonderful David Costabile. Shannon, of course, rhymes with Bannon – and the title is a play on ‘three sheets to the wind’ – a colloquialism for being drunk – also a dig at Bannon – as are the comments about Shannon no longer being in the White House. Back at home, Avery and Murphy (Candice Bergen) start the day very differently – he runs. She complains. Avery is talking about getting his own place, but it’s clear that Murphy is enjoying having him around. Meanwhile, his ratings are starting to catch up with Murphy’s. Naturally, there has to be some drama with Murphy’s network, and we meet studio executive Diana Macomber (Merle Dandridge) in this episode. Naturally, Murphy doesn’t like her. Shannon has reached out to the network to offer them the first interview on his new book – but only if Murphy interviews him. 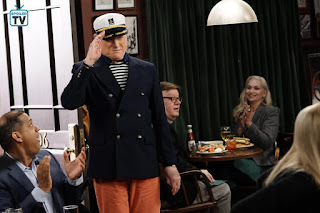 Diana wants Murphy to do it – Frank (Joe Regalbuto) freaks out and calls Shannon a Nazi. 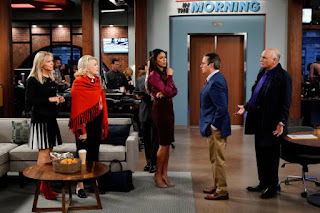 Miles (Grant Shaud) tries to curry favor by agreeing with Diana, and Pat (Nik Dodani) is excited about running Shannon’s Twitter feed live during the interview – which catches Diana’s favorable attention. We get some nice moments at the bar. Phyllis (Tyne Daly) is giving a customer a hard time about him dithering over his lunch order. 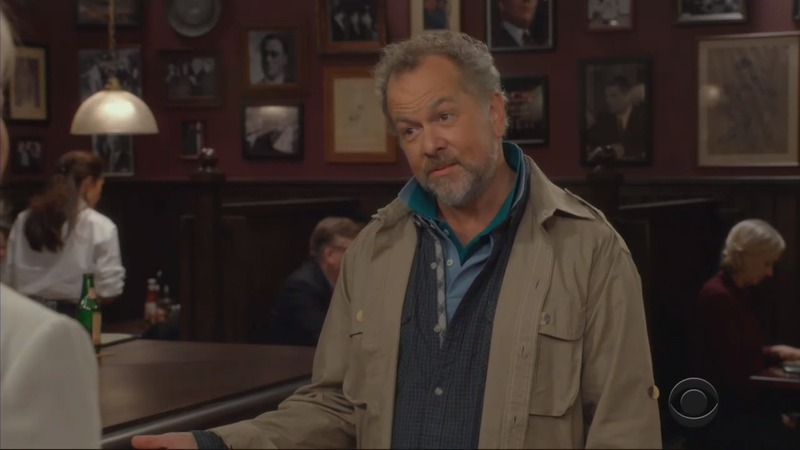 He accuses her of being a cop – and she says she spent 20 years in the toughest department of the NYPD – which is a lovely and hysterical reference to Cagney and Lacy – the show Daly played a cop on! Of course, then Phyllis clarifies that she was in parking enforcement! The gang is still talking about the potential Shannon interview. Corky (Faith Ford) references Murphy cutting Jeff Sessions down to size – “he used to be six feet – now he sleeps in an acorn!” LOL! 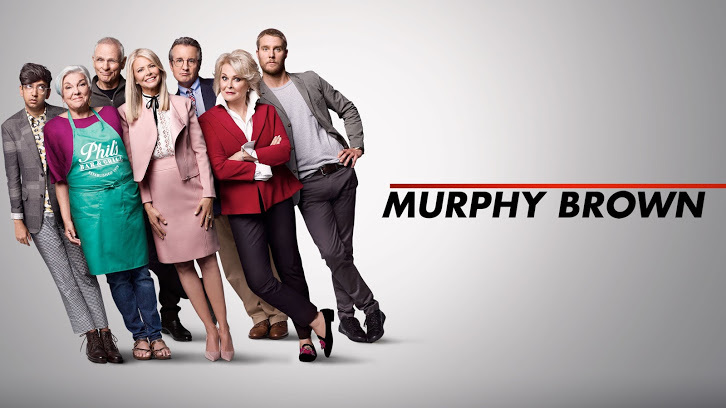 Shannon is baiting Murphy on social media, and Murphy is dithering about what to do – and wishing that Jim Dial (Charles Kimbrough) was around to advise her…. And he shows up at the bar! I loved Jim flirting with Phyllis! Kimbrough came out of retirement and will be in a multi-episode arc. Naturally, in this episode he is the voice of integrity and wisdom that Murphy was looking for. He tells her not to do the interview because she’d be giving false equivalency – making Shannon seem like legitimate news and equivalent to those really in power. Jim is adamant that giving Shannon air time and thus giving weight to what he has to say is what’s wrong with journalism today! He tells Murphy to trust her instincts – so she does just that and turns down the interview. Murphy tells Diana and says that the interview with “Horseman number four of the Apocalypse” is not going to happy, Murphy insists on reporting the news – not BEING it! Corky tells Murphy that she’s proud of her, and Miles also respects her integrity. Dianna is not quite as impressed. Murphy calls Shannon out for “picking on” Australia and Canada. Australia has all those cute animals and Canada has an adorable PM! Shannon calls her a globalist cuckold – and Murphy accuses him of worrying about losing his seat at the table. Ie, America losing its bargaining power… like that’s going to happen! Miles walks in and tells her afterwards that this was vintage Murphy – and what he wished they’d gotten on tv. As it turns out, he’s taking a hit for siding with the team on this one – losing his parking spot. The episode ends once again back at Murphy’s. Avery is watching video of Murphy with Shannon online when Murphy gets home. He tells Murphy that it’s blowing up the Internet. He tells her that she should be proud of taking Shannon down – it’s even been turned into a dance mix! All in all this was another really satisfying episode. I loved them touching on false equivalency and integrity in journalism. I’m not sold on Diana – and the management plotline, but I adored seeing Jim Dial again! What did you think of the episode? Let me know your thoughts in the comments below!